Peggy Liu has been called a "green goddess" for spurring people to talk and take action to improve China’s environmental health. While this is her work, it’s also her calling. "I do feel a personal responsibility to make a change in the world – to leave a better world for my kids and their kids," said Liu, an American who lives in Shanghai with her husband and their 12- and 10-year-old sons. She routinely monitors air pollution levels to determine whether the kids need to wear face masks. Trained in engineering, Liu heads the Joint U.S.-China Collaboration on Clean Energy (JUCCCE), a nongovernmental organization whose motto is "accelerating the greening of China for a healthier world." China has been graying lately, and not just because of an aging population. More than 260 million of its people have shifted from rural to urban centers over the last three decades, fueling the country’s economic engine but also pollution. Urbanization is speeding "environmental degradation and accelerating depletion of resources," according to a recent joint report from the Chinese government and the World Bank. "This is affecting the rest of the world," Liu said, noting, for instance, that particulate matter spewed from industrial smokestacks can drift thousands of miles. 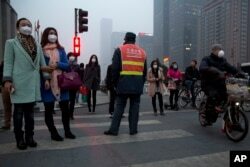 "So, we know in China that we need to win this battle on pollution. We need to win this battle on clean energy. We need to win this battle on climate change." Liu became an "accidental" combatant when, in 2007, she organized "the first public dialogue between the U.S. and Chinese government officials on clean energy," she said. The MIT Forum on the Future of Energy in China also brought together science and policy experts, business leaders and investors in Shanghai. During private talks, some participants encouraged Liu – a Massachusetts Institute of Technology graduate – to start an NGO with compatible, environmentally friendly goals. JUCCCE trains Chinese mayors and other government leaders in how to make their cities more environmentally friendly and "human centered." For instance, they learn about the smart energy grid, which meshes electrical power and information networks. It "allows us to put more solar and wind energy onto a traditional [power] grid," Liu said. "It reduces the need for buildups of power plants." The organization also encourages ecotourism, so communities can generate jobs while preserving their heritage and natural surroundings. The nonprofit has trained at least 900 government officials, some of whom oversee communities numbering into the millions, Liu said. As she noted in a 2012 talk at the MIT Sloan business school, China’s communist government can implement broad, swift changes. "We want programs to be effective in three years or less," Liu told VOA. Mayors can affect environmental policies in the short term. But long-term sustainability depends on future generations. So Liu, who’s "40-something," uses JUCCCE to cultivate nutrition awareness and environmental consciousness in youngsters. "We can teach children how to make a huge impact [on] climate change through their stomachs," she said. As China’s prosperity spread in recent decades, the country’s eating habits changed to include more meat, dairy, processed foods and soft drinks. JUCCCE’s New Way to Eat program tries to offset the trend of rising obesity, diabetes and other chronic illness, encouraging children to consume a "rainbow of color" in fresh produce every day. The curriculum also encourages youngsters to think about the planet’s health. It pushes a plant-based diet that reduces each individual’s energy footprint. With inefficiencies in farming and transportation, "food systems are the single biggest source of greenhouse gas emissions," Liu said. "Ten percent of all emissions come from food waste." And the New Way program gets buy-in from parents – already worried about the safety of processed foods – by teaching classes in both English and Mandarin. Knowing English can triple a Chinese person’s earning potential, Liu said. JUCCCE’s own translation skills are strongest in helping motivate behavioral change, Liu contends. The NGO strips away the technical jargon of environmentalism – "transit-oriented design" becomes "convenient living" – and appeals to a person’s desire for harmony to make behavioral changes. "We translate from head to heart," Liu said. That comprehensive, humanistic approach wins accolades. "Peggy Liu is one of life’s unrelentingly positive characters," Mark Prain, executive director of the Hillary Institute of International Leadership, told VOA in an email. The New Zealand-based organization has recognized her for "exceptional climate change leadership" with a 2012 award that Prain said "acknowledges what is yet to come from her as she continues to impact real change both in China and on the international stage." JUCCCE's mission goes beyond "sustainability and the greening of China,” Liu said. "… It’s about livability. It’s about how to improve the quality of life for people as we urbanize."